I’ve wanted to write about this cheese for a while, but I had to get into Nancy Drew mode to find the producer. 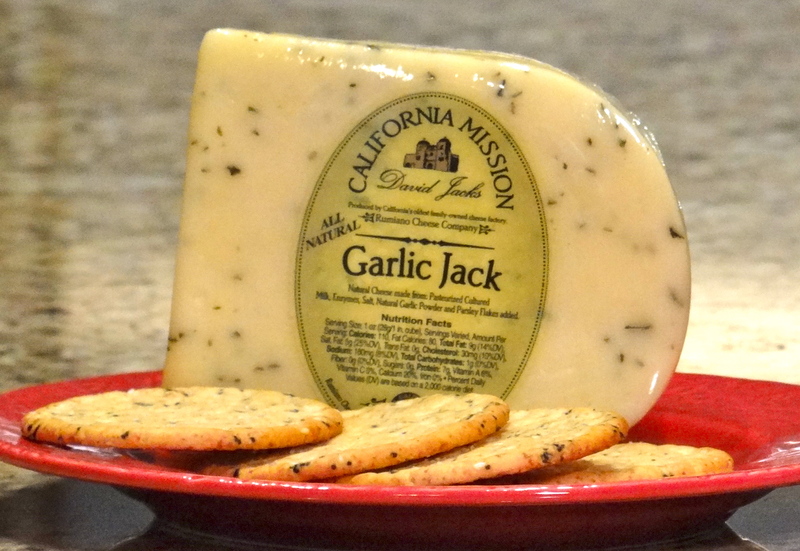 Karen and I picked up California Mission garlic jack cheese at Central Market. After shooting a quick photo, we unwrapped it and let it come to room temperature. This is one amazing cheese with a super-creamy texture and garlicky goodness. Between the five “tasters” who were present that evening, we quickly devoured it all. The fun began when I searched out the producer. I started with California Mission. Dead end. Then I clued into the person’s name on the label, David Jacks. That initiated an interesting history lesson on the origin of Monterrey Jack cheese. Mr. Jacks was a dairy owner and cheese maker in Monterrey, California. In 1882, he packaged his cheese with his name and point of origin, “Monterrey Jacks”. The “s” was dropped and eventually, Monterrey Jack became the signature cheese of California. But it wasn’t the Jacks family who produced this cheese. I couldn’t read any of the small print on the photo of the label for further clues, so I had no alternative except to buy another wedge of cheese for more research. Oh, the sacrifice! Not only did we have more delicious garlic jack cheese to eat, I now knew that the Rumiano Cheese Company was responsible for it. Italian brothers Richard, Fred and John Rumiano emigrated to the United States around 1900. After working in mines, they purchased a small dairy in Willows, California, and by the mid-1930’s, the brother had built the largest cheese company in California. Rumiano Cheese Company is now the oldest family-owned cheese company in the state, and they use local milk from third and fourth-generation family farms. Third-generation brothers Baird and John Rumiano own and operate the company, and they look forward to passing the family business to their own sons. Today, the family business focuses on food service distribution, which means you might have enjoyed Rumiano fine cheeses in your favorite restaurant, and provides cheese for private labels (such as California Mission). Fortunately, you won’t have to search as hard as I did to find Rumiano cheese. Their website offers online ordering, but also has a search function to find retailers in your area. Now that we know where to buy, we will be trying more Rumiano family cheese varieties!